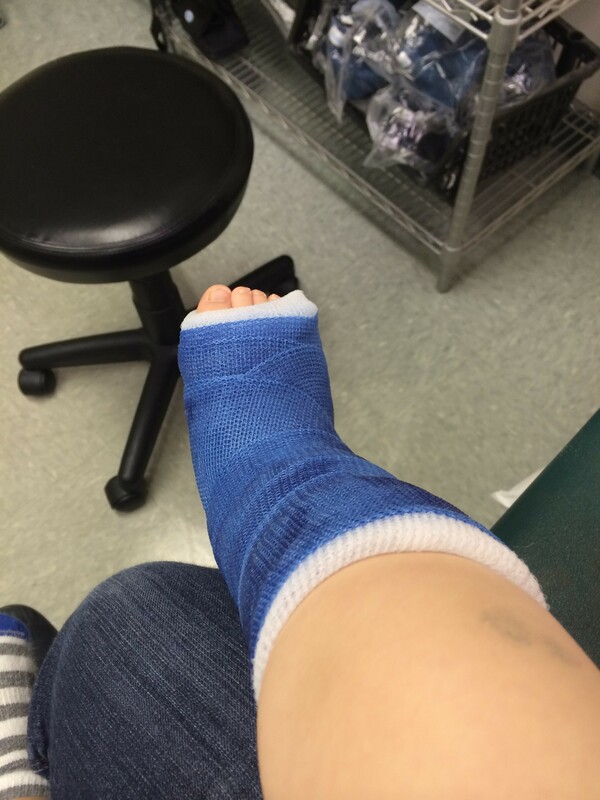 Of my three children, which would you deem the most likely to suffer a broken leg? A) The seven year-old boy who spends his days replicating ninja moves and Star Wars battles? B) The five year-old girl who spends her days attempting overly dramatic ballet and gymnastics maneuvers? C) The one year-old boy who spends his days walking laps around the first floor of my house? I was naive enough to be surprised that it was C. I mean, scrapes and bumps in spades, sure. But a broken leg? As all stories of injury or illness begin, it was of course 5pm on a Friday. That exact moment all medical office phone lines switch over to after-hours-we’re-not-here mode. He was walking laps around the kitchen and dining room, as he does 5,000 times a day. I heard him fall, as he does 5,000 times a day. He cried a little and it really didn’t seem serious, until I noticed that he was having trouble getting back up. 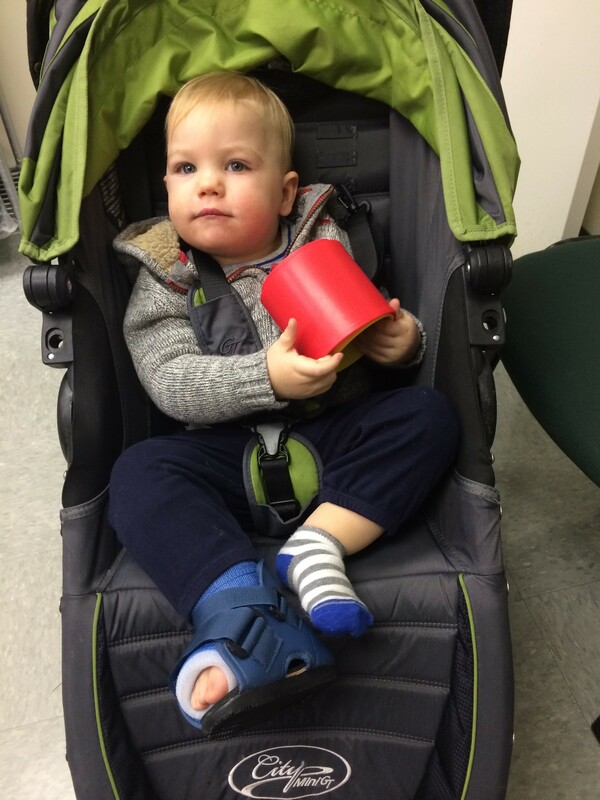 When, 30 minutes later, he still couldn’t bear any weight on his right leg, I knew I had to do what every parent loves more than anything: Drag all three kids, unfed at dinner time, to the pediatrician’s office on a Friday night. Is there really anything better? I really wasn’t expecting it to be a broken leg, but there it was. A toddler fracture, to be specific, where an “uneventful” fall at the wrong angle apparently breaks a 17 month-old tibia. The pediatrician on duty that night wasn’t our usual, but I’ll never forget him. Why? Because his face will always be burned into my brain, as he speculated that the orthopedist would tell us on Monday morning to keep the baby off of his feet for four to six weeks. These were the most complete thoughts I had in my head. These non-thoughts then gave way to visions of me sitting on the floor with a screaming kid for a month and a half, passing toys back and forth while wondering where the hell we packed away our Elf on the Shelf last Christmas. Luckily, when we did see the orthopedist, it wasn’t that bad at all. 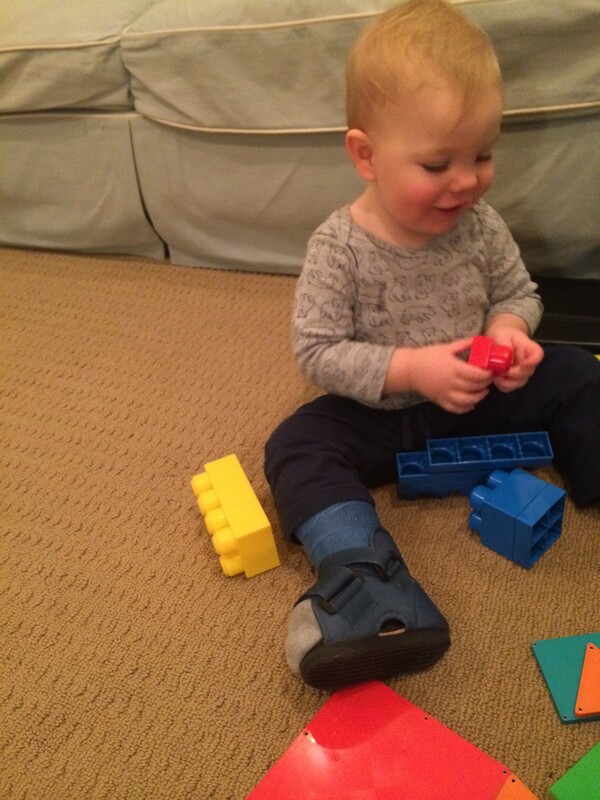 Three weeks in a hard cast and he’s allowed to walk on it when he’s comfortable doing so. Then some lovely nurse fanned out an array of swatches for me to choose the cast color, as if we were talking about window treatments. And it was done. We’re just a few days in, but let me say what a trooper this kid has been. And, while I’ve never been known for my bright-sidedness, there are other advantages to the situation. First, he is sitting. Sitting. Not running 65 mph. Not exploring every potential safety hazard in my house. Sitting and hanging out with toys on the floor. It’s like going back in time about six months. The temporary reprieve from “Dooooooon’t touch thaaaaaaaaaat!” is sort of nice. The cast is a decent means of self-defense from his siblings’ antics. One swift little baby kick with that thing and he is the alpha male in the room. Ask my seven year-old. In addition, we’ve unknowingly witnessed a global medical breakthrough here. Not in his leg, but in his response. He is a calm and happy patient. In other words, progress in the Male Injury Response Gene is showing signs of hope. If he makes it through the winter without a ManCold, I’ll know we have some Nobel-level developments here. I learned a few things about my own crisis response protocol as well. Don’t bring siblings to a medical office at dinner time on an empty stomach. Try to form wholly recognized words when faced with the prospect of keeping a baby off of his feet. And, lastly, always have more than 24 miles worth of gas in the car at 5pm on a Friday. Oh, the poor little bub!